To many... South Dakota is a backwater, podunk, cold as hell, boring, uninhabited wasteland with fowl-tasting water and a former powerful senator. To me... it's not just home, but a place I thoroughly love. Needless to say I was ticked, especially after I got myself more stuck, but also because it was my first time after living here for 8 years and driving only vehicles incapable of getting themselves out on their own. Just 5 minutes after I got stuck and as I was thinking of walking the half mile back to town on that a driver on this low traffic road stops to ask if he can offer a hand... after some pushing I was still stuck. A minute later another driver (with a pickup (a staple of South Dakota living (and with any luck, my next vehicle purchase (some day)))) stops and offers me a pull. 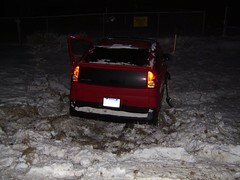 Only one problem... no one had a tow rope or chains with them... so both vehicles raced home to try to find something. While they were gone I spent a few minutes trying to shovel some of the 4-6 inch deep snow (mixed with tall grass) away from the vehicle so that we'd be able to look underneath easier as well as have slightly more traction on the way up... not to mention taking a quick picture. 20 minutes later the pickup driver returns with a chain and after some quick rigging, he pulls me out and back on to the road and a Kurt Anderson became my hero for the time being. This is part of why I love this state so... When we see someone along the side of the road in need of assistance... instinctively we stop to see if we can render assistance. We aren't worried that the person who is pulled over (or the person pulling over) might be some homicidal maniac or other crazy... we know all to well (or know someone who knows) what it's like to be stranded along the road in the middle of seemingly nowhere. I know that I'll have to leave this fine state one day... but until then I get to enjoy every minute of it... even if that includes 50+ mph cross winds in the middle of a blizzard where people (like me) still feel comfortable driving down the interstate.